Scott E. Campbell Company was founded in 1941 by Scott E. Campbell. The Company is a privately held family Corporation, doing business primarily in the greater Los Angeles area. Scott E. Campbell Company, a union fire sprinkler contractor is currently active in the design, fabrication, installation, service and repair of all types of commercial fire sprinkler systems: specializing in office tenant remodels and approved by high-rise and low-rise building owners throughout Los Angeles. Fire sprinklers are individually heat-activated. They are tied into a network of piping filled with water under pressure. When the heat from a fire raises the temperature of the fire sprinkler to its operating temperature (usually 165 deg F), a solder link will melt or a liquid filled glass bulb will shatter to open that single sprinkler, releasing water directly over the source of the heat. 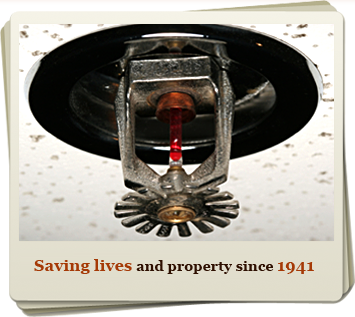 Fire sprinklers were invented by Henry S. Parmalee, an American, in 1874 to protect his piano factory. During the next 75 years fire sprinklers were installed primarily for the protection of property, especially factories and warehouses.